The best aquarium lighting is usually LEDs which will illuminate your fish tank leading to enhancement of the colors of your fish and in the process creating depth, and highlighting your aqua- scaping in the fish tank. If you have an aquarium or planning to have one, best aquarium lighting is a critical part of it. The fish in the aquarium heavily rely on receiving the right spectrum of light and intensity so they can grow and remain healthy. This means if you install the wrong lighting you’ll put the health of your fish at risk. LED lighting for an aquarium comes in a range of different of sizes. The bigger your aquarium is, the more light it will need to light it up. You’ll need to look for one with a lot of coverage and widespread intensity.Consequently for smaller aquariums, you’ll need less light and less coverage. How long the lighting will last is critical. It is common sense to go for one that lasts as long as possible. Also, it’s best that you choose your aquarium lighting with quality in mind. You should ensure the materials used to make the lighting are strong and durable. Quality may come with a higher cost but it is worth it in the long run. You should choose LED lights that aren’t likely to break, loose output, or change color spectrum in the future. •	What colors would you like to see in your tank? •	Would you like to enhance the colors of your fish or corals? The best LED lighting will create nice color blends with no visual hotspots. If the colors don’t blend well, you’re likely end up with a disco ball effect in your tank. Equally as important as the internal effect, you’ll want to make sure that your aquarium still looks good from the outside.I recommend using LED lighting that doesn’t use big bulky equipment, it tends to take away from the aesthetic appeal of your tank. You should also consider where you’re aquarium is located i.e. is it at work, your bedroom, living room, hallway, or basement? Make sure your lighting suits its location. 5. How Easy is it to Use? 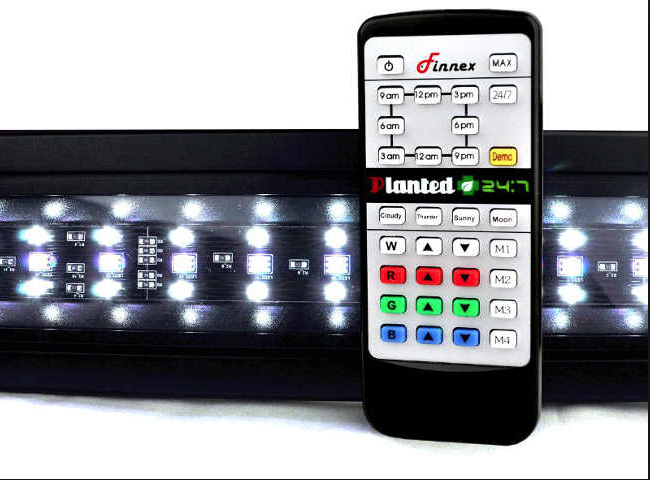 Most LED lighting will come with software and programming options. These will allow you to control the lights.Some will be more advanced; requiring the use of a computer. These come with a vast array of customizations such as, options for adjusting timing, light intensity, scheduling, custom color display, weather effects, and more.On some, you’ll even get the option to mimic times of the day: sunrise, midday, afternoon, evening, and night. These can be great options if you’re housing fish that like to stick to a schedule. 6. What Fish and Plants Are in Your Tank? Some LEDs will provide more PAR output than others. So you’ll need to identify which fish and plants are in your aquarium, and how much light they need to flourish.Also, consider what growth stage they’re at as they have different lighting requirements at different stages. This is why it’s always good to be able to adjust your lighting. If you’re unable to adjust your light intensity, you’ll have to keep purchasing different types of lighting. This is another critical consideration. You should check the cost of the lighting and also the cost of running it. In concluding, always go for lighting that best fits your aquarium considering the factors above.